After I played Final Fantasy VII, I became obsessed with RPGs. If there were one genre that could define my preference, it would be that. I played more in High School than any other genre and it defined me in so many ways. Yet that's not the only thing that shaped my beliefs. As a young teenager, there was no series bigger in the early 2000s than Grand Theft Auto. RPGs were like a private passion, but it was GTA III and the others that followed that I could share with my friends. The nights I spent just driving around GTA III and San Andreas with friends, competing with, who could cause the most destruction, was just a thrilling experience. These are memories I will never forget and the jokes that I made in this period still effect me today. For example, in GTA III there were these vans called Rumpos. I can't really get into what made them funny now. Just think about what a group of teens would say fueled by Mt. Dew and Doritos. Point is, I loved these games. Vice City, while great, didn't have as much of an impact on me since I was not nostalgic for the 80s since I was born in 1987, toward the end of that era. Anyway, whether I like it or not is not the point. What is important to note is that these games are jam-packed with Easter eggs and secret facts. How many of these did you know about? Let’s find out! There was a homeless man called Darkel that was removed from GTA III. He was going to give players bombs and missions to blow up buildings, which was thought to be cut because it might be considered tasteless. However, Rockstar denies this and has said that he was removed way before he had been fully designed.. That part is strange though considering Darkel is listed in the manual along with his voice actor, Bill Fiore. Not only that, but his model is also still in the game’s data. For most of the main characters in Grand Theft Auto, Rockstar has gone with relatively unknown actors. That is except for Ray Liotta, who played Tommy Vercetti in Vice City. He was chosen for his ties to classic mob films such as The Goodfellas, which has been referenced in many of their games. He’s had a huge Hollywood career, but funnily enough, he has only voice acted in two video games. This and Call of Duty: Black Ops II (for the zombie mode). San Andreas is the best selling PS2 game of all time. It sold over 17 million copies since its 2004 release. That's just the PS2, as the game has gone on to sell way over that on other systems. In fact, all three Grand Theft Auto games are in the top six for PS2. 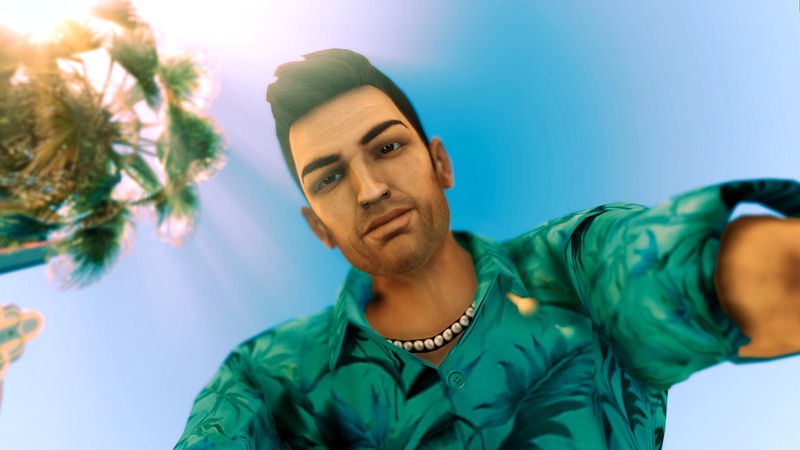 Vice City is fourth, selling over 9 million copies while GTA III is sixth, selling almost 8 million units. There is a hint in GTA III about the next game in the series: Vice City. Near the airport, you can find a billboard that says, “ See you in Miami.” There’s another clue in the game as well. After you complete the “Marked Man” mission, Ray Machowski will send you a beeper message that reads, “Take care of my Bulletproof Patriot. See you in Miami.” At the time people probably didn't even think of this possibility, but that's hard to say now. Ricardo Diaz’s mansion, which becomes yours eventually in Vice City, is almost identical to the mansion found in Scarface. This is not the only reference to the film either as the Malibu Club is modeled after the Babylon Club from that movie. There is also Apartment 3C that has a chainsaw in it, similar to a famous scene in the movie. These facts are just the tip of the iceberg. It could even be argued that the general tone and theme is taken from Scarface as it took place in Miami. Ash, Pikachu, Squirtle, Minnie, and Mickey Mouse can be seen on the sign for a gift shop in East Beach Los Santos, Juguetes Regalos, in San Andreas. This is odd considering most references to pop culture come in the form of fake, parody advertisements and not literal the products in question. The game takes place in 1992, way before Pokémon was even a thing so this was probably a mega fan of both things that snuck this one in. That’s just my theory though. If you complete all of the taxi missions in GTA III you can unlock the Borgnine Taxi. This looks like a demon version of the classic model, complete with spikes and blood. It’s a reference to Ernest Borgnine, thus the taxi’s name, as he was in a movie called Escape from New York where he drove a cab. You know, the movie that inspired Solid Snake’s name as an homage to that film’s star, Kurt Russell, as the infamous Snake Pliskin. As a bonus set of trivia, some might recognize Ernest Borgnine as the voice of Mermaid Man from SpongeBob. In Vice City, sharks can randomly appear near beaches although they have no animation. They just sort of appear and disappear. They are probably an accident within the game's code. If you jump out and attack them, they won't even react. Here's my theory. Sharks were probably going to play a role in some sort of missions referencing Jaws, but it was cut. Their spawning might be some sort of glitch that results from data still lingering in the code. The Dodo plane's wings are clipped in GTA III so you can’t really fly the thing. Well, you can but you have to be extremely good at the game. If you are you can uncover a multitude of secrets most players will never find. One of them is the mysterious “ghost island” which has a very surprising history. All it is, is the beginning bank mission. Rockstar built the assets, dumped them far off into the distance where they couldn't be seen, and that's that. Of course, fans found it though. The Ocean View Hotel, your first safe house in Vice City, looks like it has a secret room in your room. There is an outline of what appears to be a door, but no one, as of yet, has figured out how to open it. If that is a door, that is. Most likely it might be a glitched texture that resembles something like a door, or was, in fact, going to be a secret room that got scrapped along the way. There are several references to Manhunt in most of the Grand Theft Auto games. In San Andreas, there are action figures for Cash and Pigsy. You can also find the blueprints for that game's notorious mansion inside the Ocean View Hotel in Vice City. Rockstar certainly loves referencing their own history. In police stations, you can find a wanted poster for the protagonist in San Andreas and there are many others. Vice City definitely has the most though, which makes sense given that that was the next game to follow. This is probably the most famous secret from GTA III. So even though you may already know about, it'd be sacrilegious to not put it on here. Make sense? So there is a secret message in the game that you can access in a somewhat complicated fashion. One of the easiest ways is by jumping from a car to a garbage truck, which is just high enough for you to jump over a well where you can find a wall that reads, "You weren’t supposed to be able to get here you know." We're all familiar with the stars gimmick of the Grand Theft Auto series. The more crimes you do, the higher your rating and thus the harder it will be to escape. One of my favorite things to do in GTA III was pass the controller around with my friends, seeing who could get it higher and who could survive longer. I didn't play much of Vice City so I missed this reference. If you get to three stars, two detectives will appear with the police to take you down who look like the guys from the Miami Vice TV show. Young Maylay, the voice actor for CJ in San Andreas, is the cousin of Shawn Fonteno, the voice actor for Franklin from GTA V. Shawn Fonteno also played a random member of CJ’s gang, Tarnell in the Grove Street Families. This connection makes a lot of sense considering both actors, artists, performers, or whatever you want to call them, come from the San Andreas universe. When Shawn got the part for Franklin that must have been a cool upgrade for him. Rockstar certainly loves their, uh, "happy" jokes. They used to at least, but going back to these three games now I realize they've matured a lot. Not completely of course, but anyway let's get to the fact I was alluding to in the beginning. In GTA III there is a construction worker NPC you can find that spouts Village People lines and sounds a little, well you know. This reference is furthered in Vice City where you can see the troop perform in the Malibu Club, or at least a cover band. In Vice City, the name of one of the taxi companies is Kaufman Cabs, which is a reference to Andy Kaufman. He’s a pretty controversial comedian for reasons too long to get into now, but here's the relevant part. In one of his more “normal roles,” he played Latka Gravas on TV show Taxi. That show is also big for giving Danny DeVito and Christopher Lloyd their big breaks. And now look at them! They couldn’t have had a more cultural impact. In an interview with Jeux Actu, a French gaming publication, after the release of GTA V, it was revealed that the idea for multiple protagonists was taken from a scrapped idea for San Andreas. This makes a lot of sense if you think about it. The game did have a big emphasis on gangs. You could even fight in turf wars, which was my favorite side activity even though it was annoying having to go back and forth and reclaim territories. Another neat trick you can perform with the Dodo in GTA III involves even more skill than finding the ghost island, town, or whatever you want to call it. Anyway, if you literally fly to the edge of the map and look down on your minimap, you can start to see developer names appear. You can't see them in game, just on the minimap so it's a bit hard to read, but it's still a cool secret nevertheless. GTA III isn't the only game in the series to have ghost artifacts. In Vice City, you can see an airport control tower in the distance, which is clear as day near the Escobar International Airport. However, once you travel closer it will disappear. It's another piece of the game that was planned, scrapped, but a glitch in the code still causes it to appear from certain distances. Here's the strange part. It's also in the PSP sequel, Vice City Stories. Guys, clean up your mistakes. The “Hot Coffee” incident might be the most infamous controversy in Grand Theft Auto history. For those that don't know, San Andreas was planned to have a lot more, let's say, explicit content when it came to dating. It was scrapped but still remained in the code. Well, a modder found the content and released a patch online to let players access it. This caused a bit of a ruckus from concerned parties that made Rockstar recall the game from stores. So if you have an early copy, it might be worth something. GTA III was a trendsetter in many regards. Not just in gaming like popularizing the intense, sandbox action game that spawned so many clones. You could also credit GTA III for creating Twitter, er, sort of. There is an Internet cafe called Tw@ in the game, which is close to Twitter. That's not the fact, just a funny aside. So the only way to access the cafe is by breaking through the glass windows. No door? Weird. If you make it in you can see people playing the first two games in the franchise. There's one more ghost fact I'd like to share concerning Vice City. It also has to do with water like the random sharks that can appear. And like the ghost tower at the airport, you can spot these ghosts only from a distance. That would be the ghost ships. If you look on the horizon near a beach, you can spot them from a distance, way off on the edge of the world, but if you try to get close, they disappear. All they are are assets meant to strengthen the world and not meant to actually go and touch. Finally, a treat that connects all three of these PS2 masterpieces. If you shoot the moon in any of these games with a sniper rifle, it will cause it either to shrink or expand. Why? No idea, but it's a fun little Easter egg that stuck with the series for so many years. It was probably the first thing I ever tried and was amazed worked in GTA III on my own. Maybe one day we'll have a Grand Theft Auto game on the moon.